This year’s grade 4-5 Wintry Spirit Assembly, sponsored by the Service/Spirit Club, was recently held on the lower school’s blacktop with a new format. Rather than competing for points, students enjoyed various interactive stations supervised by homeroom teachers. 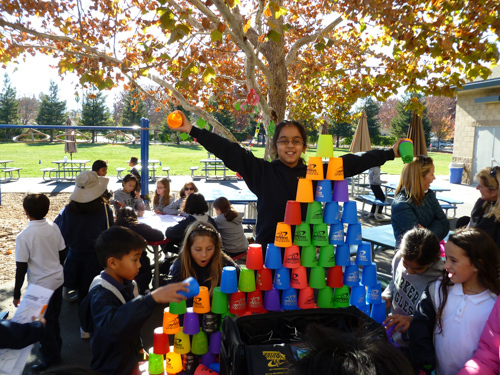 The festive, holiday-themed stations included Santa’s Workshop, where students colored and stacked various cups; Pin the Nose on Rudolph; Presents Down the Chimney, featuring students playing a lightning-quick game; and Naughty or Nice, which saw students shooting bean bags and other objects into small nets.